A young girl named Esti had a best friend named Tali whose father had kidney disease. He passed away before a kidney transplant could save his life. Esti, who was 16 at the time, vowed that one day, she would donate a kidney of her own so someone else would not have to die the way Tali’s father did. Over ten years passed and Esti’s promise remained front and center in her mind. It was a challenge, however, for this 28-year-old mother of three to find a hospital that would allow her to perform this mitzvah, even though she had now passed the age of 23, when it is legal to be an organ donor. Some people discouraged her. Others questioned her sanity. –Transplant Surgeon Dr. Abed Khaleilah. 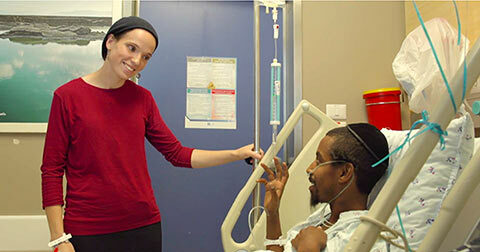 Esti persevered and her childhood dream was realized at Hadassah Hospital Ein Kerem, when she saved the life of a young Ethiopian Jewish immigrant to Israel. “I liked the idea that a kidney can go to anyone—men, women, Jewish, non-Jewish. I knew that God would direct my kidney to the person who needed it most.” Read her story. When I first heard of Esti Lerer I was told that a young 27 year old woman wanted to donate a kidney to someone she didn’t even know. I spoke to her on the phone and recommended that she wait at least another 10 years….. Esti was determined and explained in a graceful but assertive way that this was the path she had chosen. When we met face to face it was obvious that despite her young age, Esti had thoroughly thought through the risks and benefits and had decided that the benefits far outstripped the risks. As it turned out, her successful kidney donation went to a young man even younger than her. He’d been plagued with kidney disease since finishing high school. The medical match between the donor and recipient was excellent in terms of age, body type, and immune system of the recipient. Although he came from a large family and might have had potential donors there, his siblings might also have been carriers of kidney disease and we couldn’t risk a transplant from one of them. He was already on dialysis for three years and his future looked grim. Esti Lerer provided him with a new future.